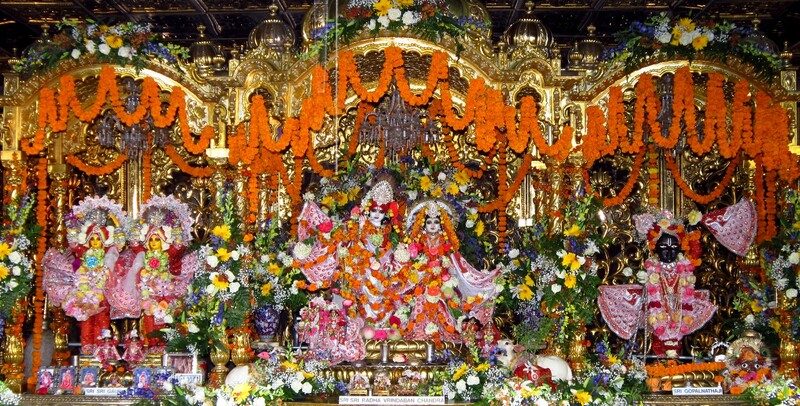 Today marks the auspicious celebration of the Appearence Day Of Lord Sri Krishna, Janmastami. We will fast all day and have a small feast at midnight. 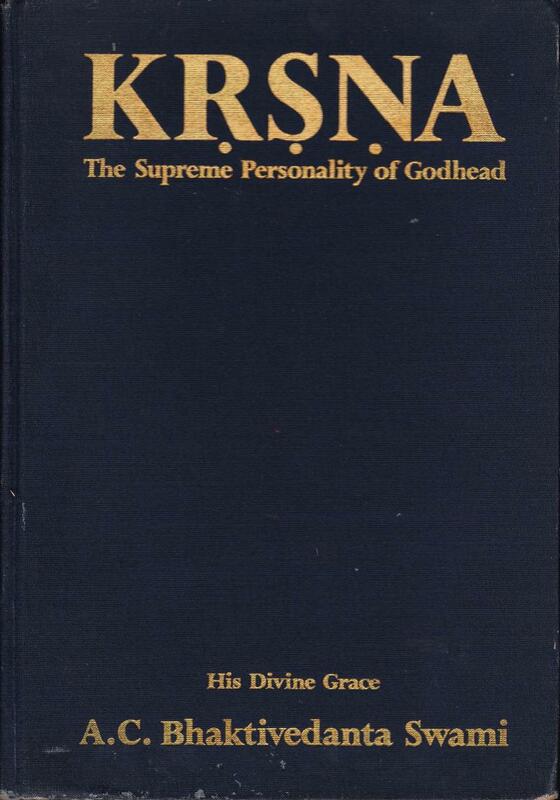 The following are some selected quotes by Srila Prabhupada on understanding Krishna. “Some way or other, be in relationship with Krishna, and you’ll be happy. You’ll be happy, this life and next life. …In that ceremony, all the brāhmaṇas assembled began to chant different kinds of Vedic mantras to invoke all good fortune for the child. 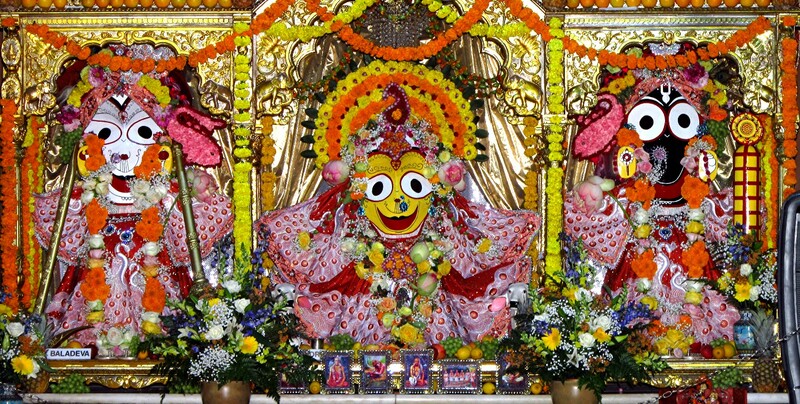 Along with this chanting of mantras and songs, bugles and kettledrums sounded outside the house. 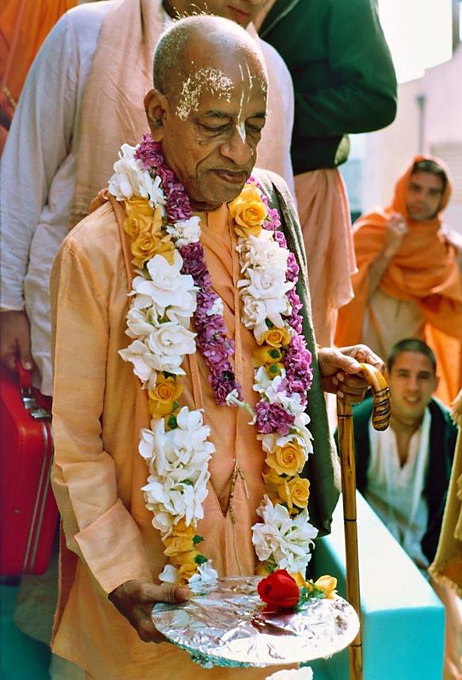 On this occasion, the joyous vibrations could be heard in all the pasturing grounds and all the houses. When all the ecstatic cowherd men heard that Nanda Mahārāja, father of Kṛṣṇa, was celebrating the birth ceremony of his son, they became spontaneously joyful. They dressed themselves with very costly garments and ornamented their bodies with different kinds of earrings and necklaces and wore great turbans on their heads. After dressing themselves in this gorgeous way, they took various kinds of presentations and thus approached the house of Nanda Mahārāja. As the dust on the lotus flower exhibits the exquisite beauty of the flower, all the gopīs (cowherd girls) applied the dust of kuṅkuma on their lotus-like faces. These beautiful gopīs took their different presentations and very soon reached the house of Mahārāja Nanda. Overburdened with their heavy hips and swollen breasts, the gopīs could not proceed very quickly towards the house of Nanda Mahārāja, but out of ecstatic love for Kṛṣṇa they began to proceeded as quickly as possible. Their ears were decorated with pearl rings, their necks were decorated with jewel padlocks, their lips and eyes were decorated with different kinds of lipstick and ointment, and their hands were decorated with nice golden bangles. As they were very hastily passing over the stone road, the flower garlands which were decorating their bodies fell to the ground, and it appeared that a shower of flowers was falling from the sky. From the movement of the different kinds of ornaments on their bodies, they were looking still more beautiful. 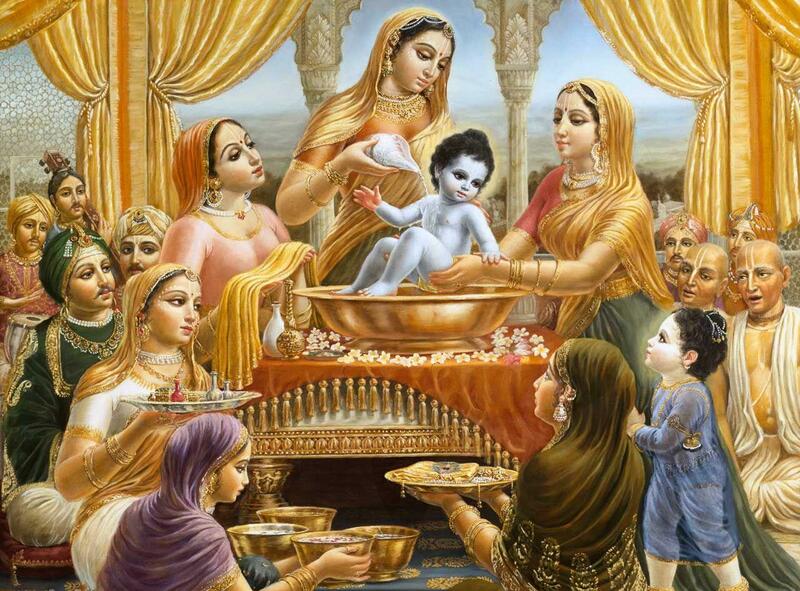 In this way, they all reached the house of Nanda-Yaśodā and blessed the child: “Dear child, You live long just to protect us.” While they were blessing child Kṛṣṇa in this way, they offered a mixture of turmeric powder with oil, yogurt, milk and water. They not only sprinkled this mixture on the body of child Kṛṣṇa but on all other persons who were present there. Also on that auspicious occasion, there were different bands of expert musicians playing.